Is It Easy or a Struggle to Get These Moths to Take Flight on the Magazine Cover? After the thumbnail sketch was approved, I had to make a final drawing of the magazine cover to be approved before I could move on to fleshing it out with color, shadow and light. 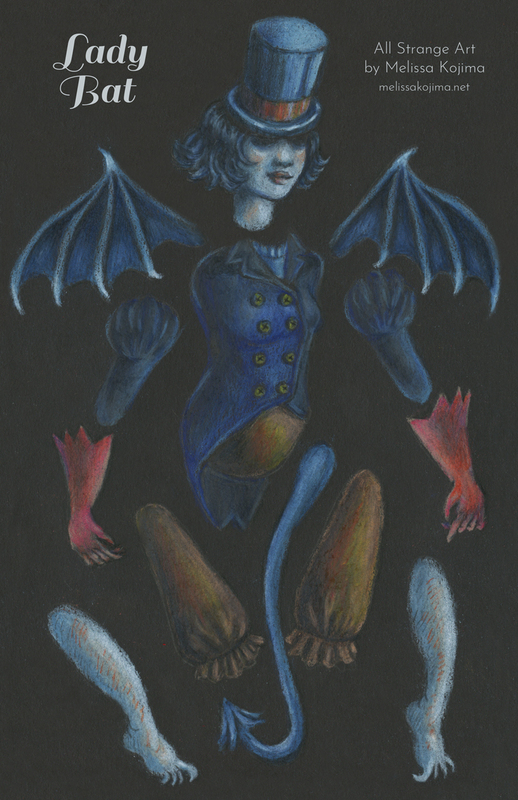 Below is the final drawing I sent to the Metaphorosis editor. Did he have any changes? Was I able to capture the feel of the strange story with my strange illustration? The editor approved it, only saying that I needed to keep in mind the dimensions of the cover which were a little more narrower than my above drawing. That was easy to fix by cropping off the sides, since nothing of importance was at the edges. All of the essential visual information resided in the middle of my illustration. So far, it has been easy to do this cover. Admittedly, I wasn’t sure how to portray the boy before I drew him in detail. Did I want to show him as a misfit? Did I want to show that he was angry with his mom? Could I visually bring out the brainy kid that his mother didn’t understand? In the end, I think I showed the curious and fearless kid that I could relate to in the story. What’s next after the drawing is the color, shading and light. They will be the tougher challenge and may be an actual struggle. If you stay tuned, you may get to see me fall flat on my face in my execution. That is always my fear. It’s like I draw myself into a corner and then I have to color my way out of it. If we have any luck, I’ll be able to pull this out of me like a butterfly from a caterpillar (yes, that was a nod at the task I have ahead). Which Thumbnail Sketch Will Become the Magazine Cover for Metaphorosis? Before I even start the wheels turing and scribbling down some sketchy ideas for magazine covers, I get stories to read, so I can decide which one pricks my imagination the most to illustrate. This time for Metaphorosis, all 4 of the stories I read had powerful visuals for me. They were all equally compelling, none standing out from the other. What was I to do? I couldn’t choose one. I made a thumbnail sketch for each story (as you can see above) and asked a friend which one he liked the most. He picked a couple, but I still wasn’t sure what to do. I decided to send all the sketches to the editor and see which ones he found the most compelling. Strangely, he also chose the same two that my friend chose as his favorites from the 4 sketches. That gave me confirmation to choose one of the two sketches to make into the May 2019 Metaphorosis cover. They are the bottom two sketches of the spaceship and a boy surrounded by moths. Which one did I decide to create into the cover? Which one would you have chosen? I finally picked the boy with the moths. Stay tuned during the next few weeks if you want to see the evolution of this cover. I’ll share my work in progress, so you can see if I was able to make this sketch into something worthy of awe and attention. It’s always unknown to me if it will be easy or a struggle. Here's to Strong, Strange, Amazing Women Who Refuse to Fit It In and Defiantly Be Themselves! It’s International Women’s Day so I had to just say hooray for all the strange, strong and awesome ladies in my life. This seems an appropriate time to name a few of them. There’s my Canadian graffiti artist friend who has always been a champion for my art even when it sucked when I was starting out! There’s my 80 year old gal pal who still swims on a regular basis and tells me to never give up even when the going has been very tough. There’s my Hungarian friend who is just the sweetest, kindest animal loving gal I know. There’s my Dodger loving babe who creates amazing crochet jewelry like a lotus bracelet for me. 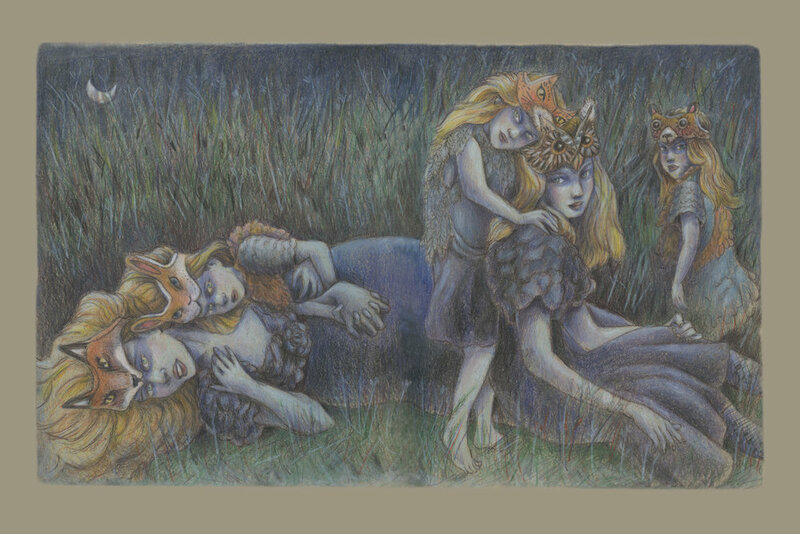 My drawing of strange, mysterious women, titled, “Night Time Magic Girls in Masks”. Detail of it is available as a $5.00 card here. There are sooooo many more. Thank you, awesome ladies for being in my life! Hooray for you and hooray for all women everywhere. May you feel strong enough to be who you are in all your realness, in all your glory. I wish the same for myself. Since Jill McVarish Gallery in Astoria, Oregon invited me to the “Doll” group show in their “Secret Gallery”, I thought my Victorian inspired, freak show monster paper puppets would be perfect there. I’m not sure who knows what a paper puppet is, so in case you don’t know, they are paper dolls with heads, arms, legs and torsos that move on a paper brad hinge. You can move their parts to play with them or to make a stop motion animation. I love strange things and maybe, these are part of that. What do you think? Each original paper puppet was created with colored pencil and has it’s own 9” x 11” homemade shadow box in which to live, move and play. The “Doll” group show starts March 8, 2019 and runs through the first week in April. Who knows what wondrous things will be there besides my freak show paper puppets. If you’re interested in purchasing the original artwork, please inquire at the Jill McVarish Gallery. Gentleman Skull Freak Show Paper Puppet. 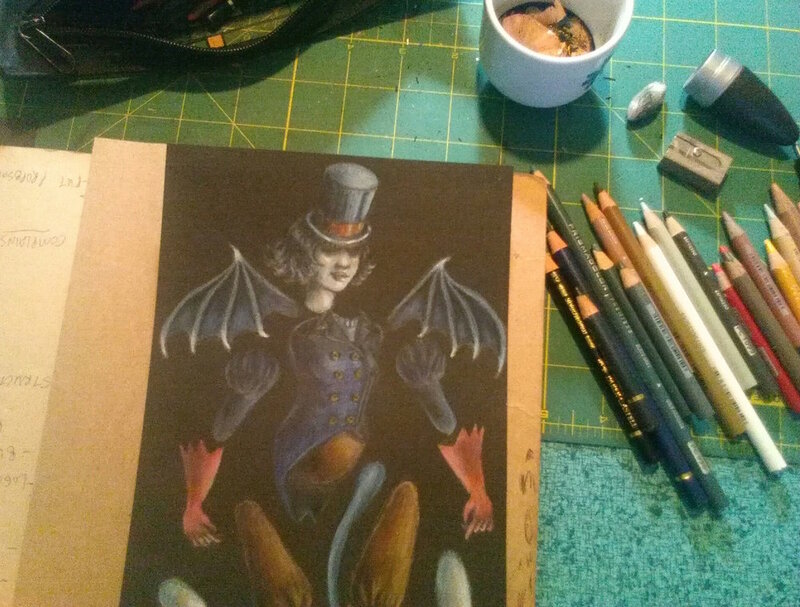 Lady Bat Freak Show Paper Puppet. Lady Medusa Freak Show Paper Puppet. 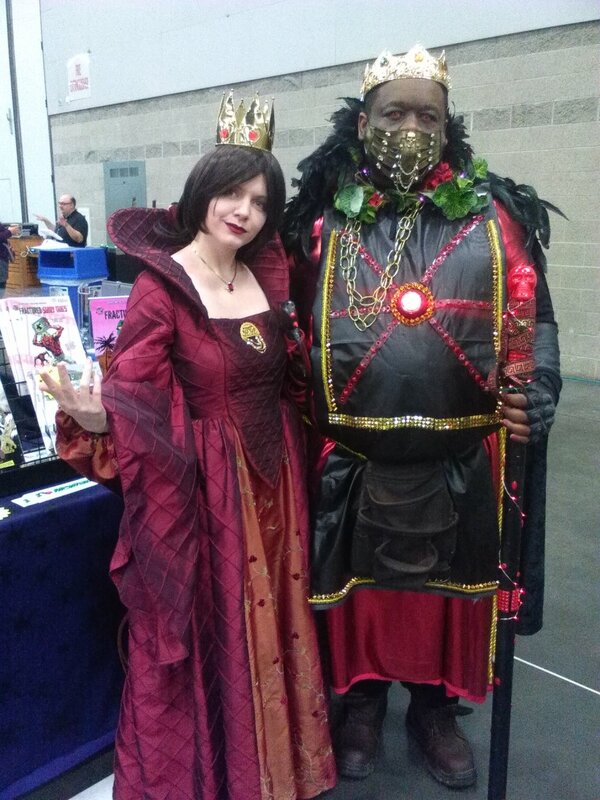 Wizard World Convention was a new experience for me since it was my first time having an artist table there, so granted, most things there were strange to me. But here are 5 strangest things that happened to me. Melissa Kojima in front of her artist’s alley table at Wizard World Comic Convention in February 2019. What? IT’S NOT ABOUT THE ART? This convention was more about the T.V. and movie celebrities than anything, leaving comic books and art to take 2nd fiddle to them. This hit me as strange. I had no idea. Venders sold products with pictures of the celebrities and comic book characters on them like pillows, towels, plush toys and pins. Most of the artists there were doing the same thing if they wanted to make money. Digital art, celebrity portraits were sold at almost every artist’s table. My art was one of the anomalies because it was original and hand drawn. So as you could guess, my art got a lot less attention and sales than the others around me. 2. WHAT DO YOU MEAN MY ART REMINDS YOU OF ‘ALICE IN WONDERLAND’, BUT ‘WONDERLAND’ FANS DON’T CARE ABOUT IT? The people who stopped by my table described my art as whimsical but dark and it reminded them of Alice and Wonderland. That didn’t surprise me. I’ve heard that before. This made me think that all those cosplayers wearing Alice in Wonderland costumes, top hats and steampunk gear would find my art fascinating and attractive. But strangely, none of them stopped by——-Oh wait! No——I forgot one of them did stop at my table. In his Mad Hatter costume, he asked me if I sold picture frames, since my art was framed. When I said no, he left without glancing at my table wares. 3. What? NOBODY REALLY KNOWS WHAT PAPER PUPPETS ARE? I made 3 special Victorian monster creature paper puppets for the comic convention, believing people would love to take home a print of them, to cut them out and make their own creatures to play with. But I had several people ask what they were. They didn’t know that they moved. They had never seen anything like them before. I guess, I was showing them something so new, they couldn’t get their minds around it. What? You can actually move its arms, head and legs? You can make a stop-motion video with them? It was so strange to me. I really had no idea. Do you know what paper puppets are? Or are you one of the folks who is in the know? 4. MEN ACTUALLY COMPLIMENTED and liked MY ARTWORK? Over and over, I was told that my art was beautiful, pretty and even gorgeous. I really appreciated the compliments. It usually came from women or girls. If there were men around my table, they were usually with their families or women. When groups of men stopped and looked and even complimented my art, I was surprised. I didn’t know that they would find it interesting. I’ve heard over and over again from my friends that my art looks like it’s for kids or it looks like it’s from a storybook, and not to mention, it’s very feminine, so it was strange that there were men who found value in it. What? You didn’t need to see a big, violent fight scene with aggression and violence spilling over the page to stop and look? It was nice to know that not all men needed to have that in their art to find it valuable in some way. That said, none of my sales were to men or boys. The scary ghost twin cosplayers from the movie, The Shining. The elegant Great Gatsby flapper cosplayer. 5. Did you KNow MY LARGEST SALE WAS FROM A NON-COMIC BOOK CONVENTION PERSON? Yes, women were there and supported my art. They stopped and talked to me about being fascinated by my Moon Lady Card and Haunted Head House Ladies prints and drawings. They were there with their daughters or friends. They were older or very young in cosplay furry outfits. On the first day, a middle-aged woman was there with her daughter and they bought a Lady Bat paper puppet doll to make and play with. On the last day, they came back and decided to buy a giclee print of the Haunted Head House Lady. They told me they were putting together an Airbnb rental room with a spooky theme to it, so my print would work with it. That was fun to learn, I’d be a part of it. But the biggest sale I got was from the sister of the man tabling at a neighboring artist table. She came to see her brother and she told me she’d never been to a convention before. She spent quite a bit of time looking at my original art and framed prints. She said she really loved the colors and thought maybe her grand daughter or niece might like my art. She took pictures and sent them out on her phone. The girls responded to her and it turned out that they weren’t interested in my art. I thought that was the end of that, but she finally realized she had to get something for herself, so she bought one of my framed giclee prints from my series of “Moon, Magic and Night Time Girls”. I was so happy to get a big sale. It really made my day and it made the convention less disappointing. 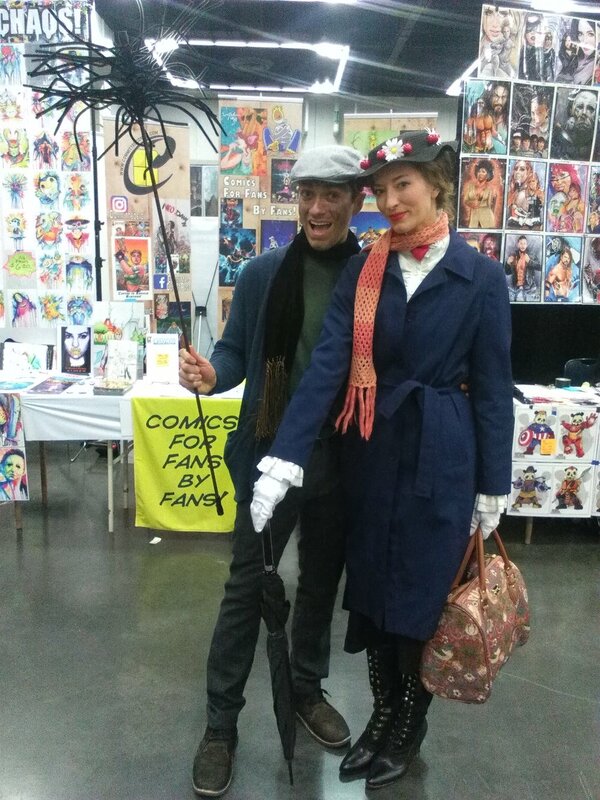 Mary Poppins and Burt Cosplayers. That said, I already paid for my artist’s table at Rose City Comic Convention before this Wizard World Convention, so I’ll be doing that in September of this year. I talked to a lot of people about it and they have told me it is much more oriented towards artists, alternative artwork and there is a much bigger attendance. Wish me luck. Hopefully, I’ll be able to break even or make a profit this time. If you’d like to support my art, come on by next time or buy some artwork online from me. I changed the set up of my artist table every day of the 3 day convention. Who Else Loves Ghosts? Come See My Ghost Art at Wizard World Convention Portland! Well, there’s still plenty of time to get over to the Oregon Convention Center for Wizard World Convention in Portland, Oregon. If you come, you’ll get to see my series of ghost artwork and more. Please use my discount code to get 20% off: KOJIMA20. I hope to see you there. A few of the ghost artworks I have displayed at the Wizard World Convention in Portland, Oregon. One of them is an art print for sale at $20.00 each. My 15 new artworks are framed and ready to be displayed at Wizard World Convention in Portland, Oregon. This will be the first time I have so many of my artworks displayed together in one place—-almost like a solo show. Moreover, it’s the culmination of creating an art series I call, “Moons, Magic and Night Time Girls”. Below is your last sneak peek of some of the art before this weekend’s main event and everything is revealed. Lady Bat paper puppet will be for sale as a DIY print for $5.00 and the original, assembled art in a homemade shadow box for $300.00. I’m not sure what to expect since this is my first time doing artist alley at a convention. But if what happened at the printer is any indication of how the convention will go, then I’m excited. I went to get a few high quality art prints and the printer loved my art so much, she bought one of my prints. I was surprised and happy at my good fortune. I hope the convention will bring just as much enthusiasm for my artwork and more good fortune. 1 of the 6 high quality art prints with archival ink and upon archival Canson Photographique paper. Titled, “Ghost Tears”. 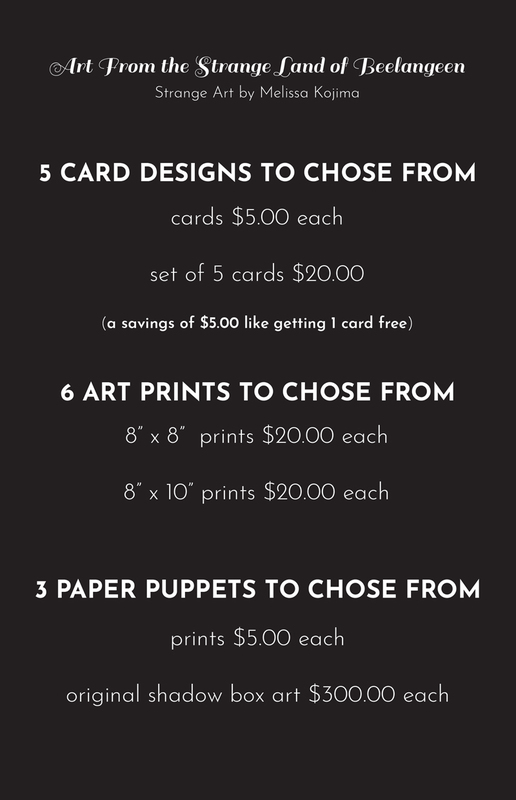 $20.00 for each art print. Below is a list of all the things I’ll have for sale—-except the original framed artwork—-which is on another list. I’m really proud of this series and feel like it’s some of my best work yet. It feels like a break-though. Usually after creating art, I feel like I did an alright job and hope I’ll make something better next time. This time, I was in awe of the art I made and couldn’t wait to create more to see what I’d do. That’s a big difference. The list of what I will be selling at Wizard World Convention Portland, Oregon, Feb 22-24. The original artwork for sale is on a separate list. Please come to see the art and visit me if you’re in Portland, Oregon. This really is a big step for me, and I’d really appreciate your support. Make sure to use my 20% off code from the price of admission: KOJIMA20. See you there. Here’s another peek at my desk as I get ready for the Wizard World Comic at the end of February. This is going to be “Lady Bat” and she will be available to purchase at my artist alley table. I’ll keep giving you more peeks in the weeks to come. If you do come, please use my discount code: KOJIMA20 for 20% off on admission price. Yes, I’m still working on getting new art done for Wizard World Comic Con at the end of February. Here’s a peek at what’s on my desk. You can see magic girls in masks and some night time things (Lady Bat). If you plan on coming to see all the strange art I’m creating, please use my special code (KOJIMA20) to get the discount you deserve. If you remember from last week, I was working on the moon drawing I’m calling, “What We Do When We’re Queens”. I have made a little progress on the lady’s dress and made her face a little more shadowy. I’ll be sure to post more peeks as I make more progress.